In October of 2017 Floridians saw the emergence of a red tide on the white sandy beaches of the Gulf Coast. Local officials immediately closed beach access and sent out public notices of its dangers. Over a year later, the red tide remained, making it the longest red tide invasion in more than a decade. 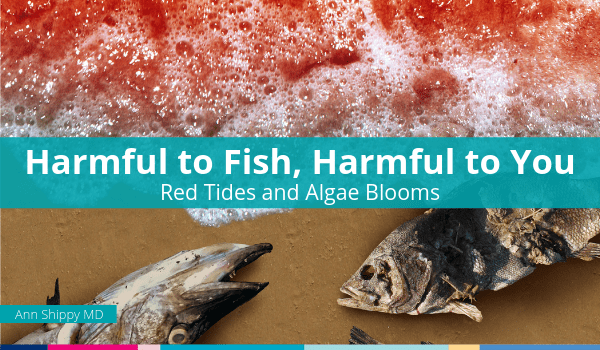 Red tides are highly toxic to human and marine life. Florida’s red tide has left devastation in its wake including the deaths of sea turtles, fish, dolphins, manatees and marine plant life. The Sunshine’s State once booming tourism industry also took a massive hit—so much that Governor Rick Scott declared a state of emergency. Oceanic red tides have been documented since the 1500s. They’re a natural occurrence in marine life that emerge and dissipate on their own. 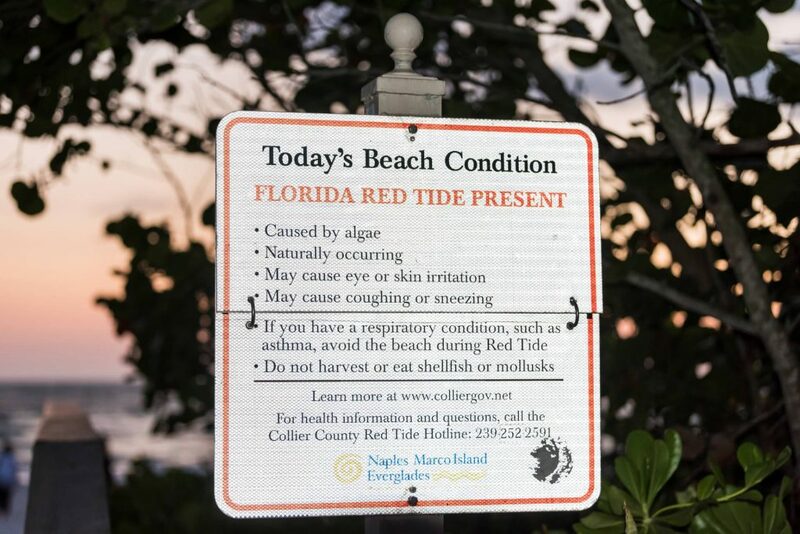 A red tide comes from a single-celled organism called karenia brevis algae that releases a neurotoxin called brevetoxin. Forbes reports that brevetoxins are benign when in low concentration—like in California’s red tide in 2018. Scientists warn that we’re seeing severe red tides that are lasting far longer than normal. (The longest red tide in Florida was 17-months in 2005.) Florida has been hit with multiple tropical storms and hurricanes like Irma in 2017 and Florence in 2018. When hurricanes hit, the intense precipitation and nutrient-rich agricultural runoff and urban runoff “feed” the karenia brevis. A study from the University of Miami reported that brevetoxins have become 13 to 18 fold more abundant between 1994 and 2002. Scientists are studying whether global warming could cause us to have more intense storms and thus, more severe and more frequent red tides. New England got hit in the fall of 2016 with a neurotoxic alga that causes memory loss and brain damage. The HABs started in Rhode Island waters and spread to other parts of New England. It was the first time residents had seen anything like it. The state shut down many of its shellfishing beds out of fear that the toxin could be passed down the food chain from oysters and clams to humans. The Great Lakes region also struggles with yearly HAB events. A study from the University of Michigan found cyanobacteria cells live at the bottom of the lake during the winter and reemerge in the spring when storms perpetuate the cyanobacteria to start actively growing. The Great Lakes is the largest body of freshwater on Earth. The region depends on the financial support from the Environmental Protection Agency to protect and restore portions of it. In 2010 the federal government started the Great Lakes Restoration Initiative (GLRI) by allocating $2.2 billion to eight states along the Great Lakes. The initiative improved water quality, pollution control and waterfront development. It also helped control the algae and other contaminants that offset the ecological balance. This year it became a bipartisan battle when the current administration proposed to eliminate $300 million from the GLRI. Members of Congress from the Great Lakes region worked together and secured funding for the program’s continuation not only to protect drinking water and the environment but also for the economic development of the region. We need to be more aware of the toxicity of HAB events. Pay heed to all warnings from officials. Microorganisms like cyanotoxins, anatoxin-a and microcystins are found in toxic blooms can be lethal to humans, pets and fish. The Centers for Disease Control and Prevention warns not to “swim, water ski, or boat in areas where the water is discolored or where you see foam, scum, or mats of algae on the water.” If you do find yourself in water with harmful algal blooms, rinse off with fresh water immediately. Being in contaminated water can make you really sick. Headaches, fever, diarrhea, abdominal pain, nausea and vomiting or skin reactions are all symptoms indicating you may have been exposed to cyanotoxins. Get immediate medical help. As the weather patterns change, we could confront more toxic algae blooms and red tides. We can only hope to have enough provisions that keep our water, marine life and our health safe. In the meantime, we must hold our elected officials accountable for upholding initiatives and laws that protect our waterways and oceans. We can also choose to live in a more sustainable way. I always teach that, even when we feel helpless about some things in the environment that are out of our direct control, we can still focus on the things we CAN control and change. One of the ways we can take action about such environmental factors is to support our bodies’ ability to detoxify with supplementation. Our Paleo Detox Protein is a great (and delicious) way to support your overall metabolic detoxification process while balancing phase I and II detoxification pathways.